Failing to protect students is failing to protect the future. The American education system has room for improvement, and policy changes could either help put the country on track or derail progress altogether. It’s been a year and a half since Trump-nominated Betsy DeVos was confirmed as U.S. Secretary of Education. The contentious process ended with Vice President Mike Pence casting the tie-breaking vote, confirming her 51-50. DeVos’ lack of background in education has been criticized and still remains a cause for concern as to how she will impact U.S. education during her tenure. 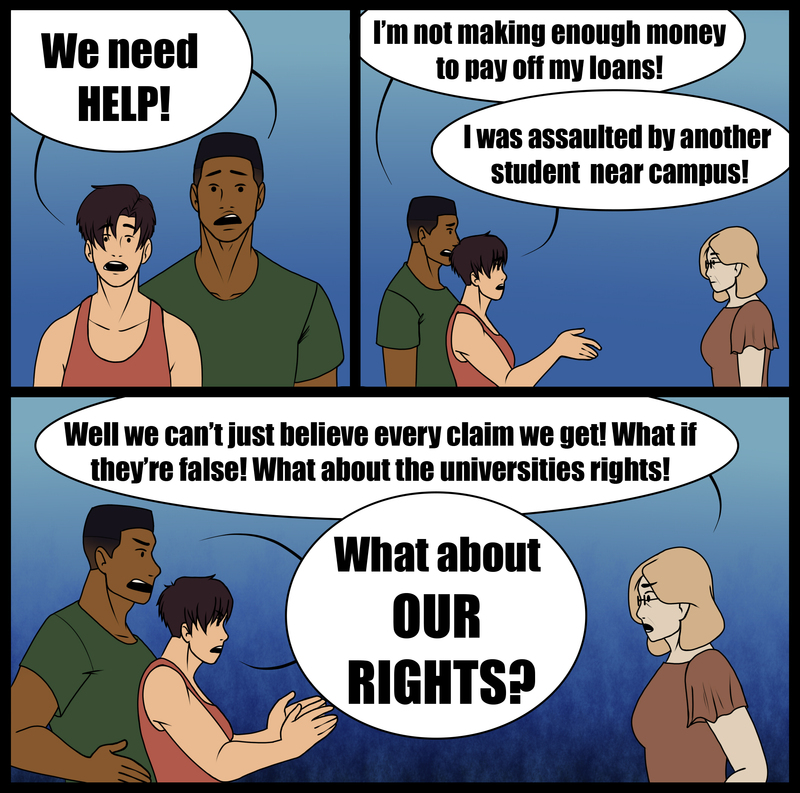 And while the verdict is not entirely in just yet, the road forward includes proposals affecting students’ rights and protections both financially and socially. Gainful employment regulations designed to hold institutions accountable to certain standards could be rescinded. The regulations require college graduates to earn enough money to pay back their loans for the college to receive federally guaranteed student loans. As a result, some for-profit colleges, such as ITT Technical Institute, had to shut their doors. The regulations serve to protect the student, also a consumer, and hold colleges accountable. Removing or modifying these regulations could open the door back up for some for-profit colleges to take advantage of students again. And those who were already taken advantage of may have a harder time seeking student loan debt relief if proposed changes are made to borrower defense. Affected students have been able to submit claims if they were wronged by a college’s deceptive practices. However, the policy’s implementation has been delayed, and the most recent proposed changes won’t take effect for a year. The changes also put more strict conditions on making a claim. “[T]he Department is seeking comment on how to balance the need to protect borrowers from acts of institutional fraud with the need to protect taxpayers from the high cost of unjustified claims,” the Department of Education said in a press release. So, here’s a comment for them. While false claims are always a possibility, the protection of those defrauded is more important by comparison. The consumer should generally be more protected than a business. Much like the borrower defense, these policy changes have the institution, or business, in mind instead of the student. And part of the reason is, once again, concerns about false claims although in a different context. Sexual assault on college campuses has unfortunately continued to pop up in the news, and not every case can receive national attention. The possibility of a false sexual assault claim does not mean a policy should be implemented, which could give institutions more reasons and ways to disregard claims. It’s no surprise that DeVos, a billionaire businesswoman with no background working in education, and her policies favor the business side of things. Colleges and institutions need protection for students. And while no policy is perfect, weakening students’ rights and protections is going in the wrong direction.